The market is flooded with chemical-based skin and hair care products for you to experiment. However, is the cost incurred worth it? You should know that the most effective skin and hair care is offered by natural products and treatments. Below, we've revealed some cheat tricks and secrets to achieve the most coveted hair and skin, naturally. Step 1: When bathing, make use of lukewarm water. Refrain from using hot water as it has been proved to strip your skin and hair of its natural oils that help keep them smooth and supple. Wipe your face with a soft towel that does not cause any bruises while wiping off the excess water. Also, in the case of your hair, let it air- dry rather than blow drying it and exposing it to high intensity hot air eventually making it dry and easy to break. 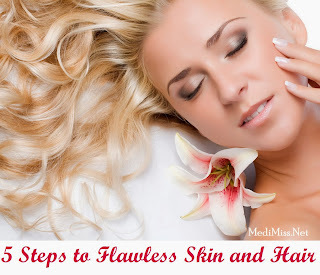 Step 2: You must understand the value of having healthy skin and hair. If you wish to flaunt seamless, healthy skin and hair, you need to treat them like fine possessions. While applying cream or moisturizers, apply them gently running your fingers through your face. As far as possible, try keeping your hands away from your face and hair to avoid getting germs deposited on them. Step 3: Indulge in natural skin care by exfoliating your skin with herbal skin cleansers and moisturizers that offer nutrition and vital minerals to your skin. Use herbs infused, skin refreshing scrubs to ward off all the dead cells bringing forth fresh, refined skin. In terms of hair, opt for natural hair care products such as shampoos, conditioners to help enhance the quality of your hair without artificial chemicals. You can also apply yogurt, eggs, warm oil to your hair on weekends to improve the deteriorating condition of your hair. Step 4: Walking out in the sun without applying any skin care sunscreen or hair sunscreen is calling for trouble. Invest in natural sunscreens available for both your skin as well as hair protection. Doing this as and when you're out in the sun will leave your skin and hair untouched and undamaged almost miraculously. Step 5: When it comes to blemishes, scars, wrinkles, and other skin imperfections, relax. You could opt for Microdermabrasion. This is a type of skin refining process that makes use of no chemicals or laser procedure. An ideal way of eliminating artificial skin care products is by taking them off your itinerary and making use of natural, pure, chemical- free approaches. If you're concerned about where to get the best possible natural beauty products to benefit your skin and hair, fret not! With the advent of technology, you can get all your beauty products online. Along with this, load your diet with healthy foods and drinks that are rich in antioxidants and other vital minerals to destroy the damage caused by the environmental pollution. Some of the skin and hair benefiting foods include green tea as well as fresh fruits and vegetables that are a powerhouse of vitamin A, C and E.